Owen and Ollie at the Baths, originally uploaded by bill kralovec. 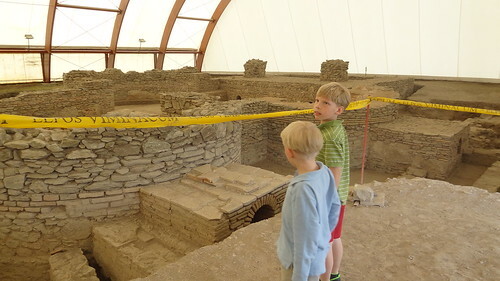 Earlier this month we visited the ancient ruins of the city of Viminacium. (Viminacijum in Serbian) The city was founded by the Romans around the birth of Jesus. Viminacium on the Danube River, close to the modern Serbian town of Kostolac, about an hour’s drive from Belgrade. Viminacium in its peak had an estimated 40,000+ citizens. Many of the famous Roman Emperors visited or stayed in the city. Several battles in the many civil wars of the Roman Empire occurred there as well. The Romans established the city first as a military garrison while conquering the local Illyrians (Dacians) and later a market town grew up around the barracks. We arrived late in the day and the site was closing. We still drove around to the excavated sites and got a sense of the place. Most of the city is not excavated, only 3 major sites, which are covered (see above). Researchers have found 35,000 graves, coins, vases, etc. The city was eventually overrun and destroyed by the man himself, Attila the Hun in 441 C.E. The Avars (ancient Turkish tribe) finished the job in 582, paving the way for the Slavs (Serbs) to come in an eventually settle the area. It was amazing to think about all that went on there, such a long time ago! I hope they develop the project further, there is probably a lot that needs to be excavated and researched. The structures uncovered are not that impressive, no coliseums, statues of Caesar, etc, but I think they could make an excellent museum and educational center with the pieces they found. They had several books for sale in the visitor center with photos and information about the site, but no actual pieces displayed. We also so some chariots which would have been cool for the kids to ride in. I just don’t see the funds available to further carry on the work. Perhaps the coal company operating next to the site can support excavation. 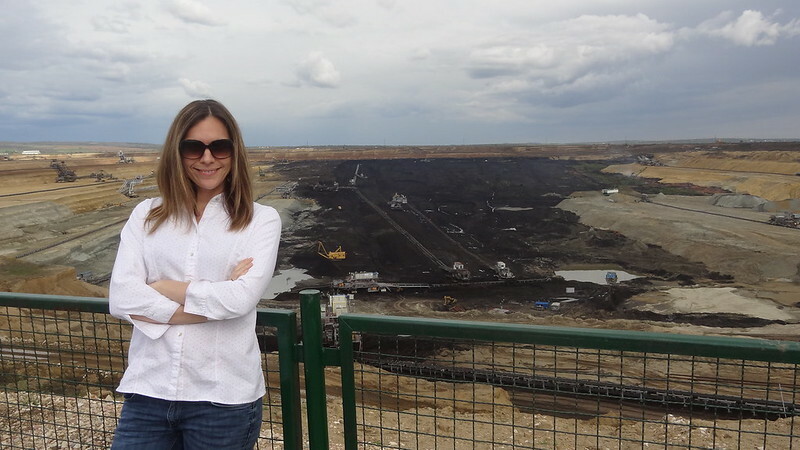 There is a massive open pit coal mine there as well as a coal-burning electricity generation plant. It would be nice to tax those polluters and put the proceeds towards Viminacium. We will probably head back to the site and read some more about it. On a side note, the town of Stari Kostolac (Old Kostolac), close to the site, is a Roma or Gypsy village. We were driving back from the site through their and Nadia was freaking out when she saw the run-down settlement and only gypsies. I would also like to go back and explore the town a bit more. A friend told us the village used to be Serbian, but was abandoned and the Roma moved in. It makes a good day trip from Belgrade. One interesting fact – back in the first half of the 15th century, Serbian masons used stone material from the Viminacium ruins to build the Smederevo fortress. Back in the days, the ruins would have stood much higher up than it is the case today. So if you ever visit Smederevo fortress, some of the stone boulders used in its walls were actually brought there from Viminacium ruins.